Synced-Data Applications: The Future of End-User Software? 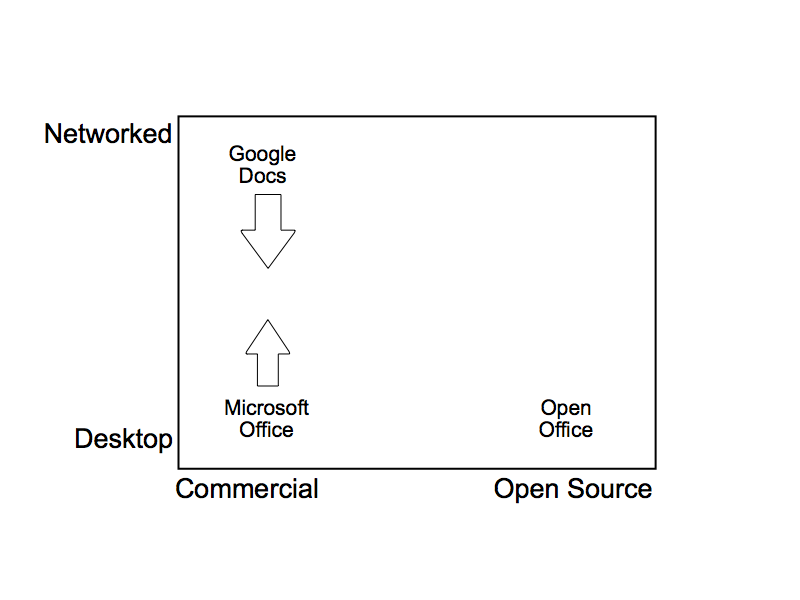 I recently asked: Is desktop software is dead? Increasingly, I am of the opinion that desktop software is well on its way to extinction. In its place, Synced-Data Applications (SDAs) have emerged. One of the best examples I’ve recently run across is Evernote. Native Evernote applications exist for desktops (as well as handhelds) and for the cloud (e.g., via a Web browser). 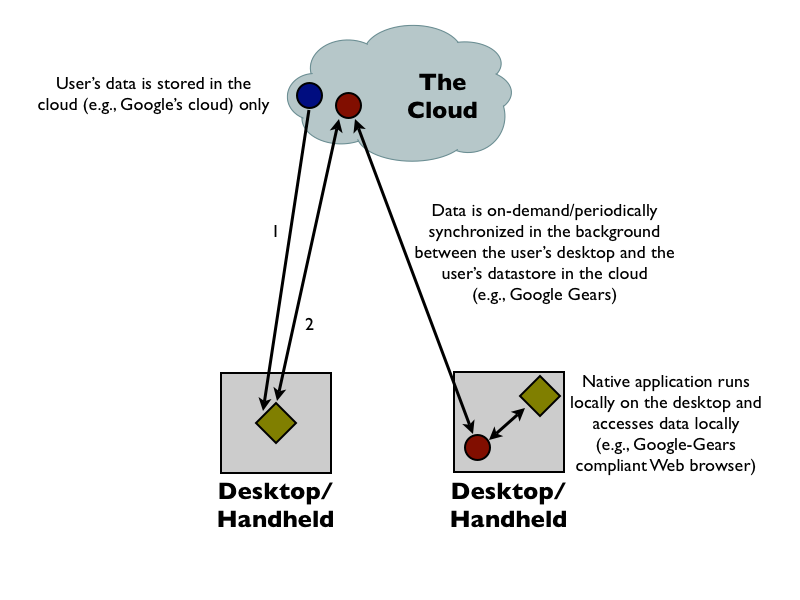 Your data is replicated between the cloud (in this example, Evernote’s Webstores) and your desktop(s)/handheld(s). 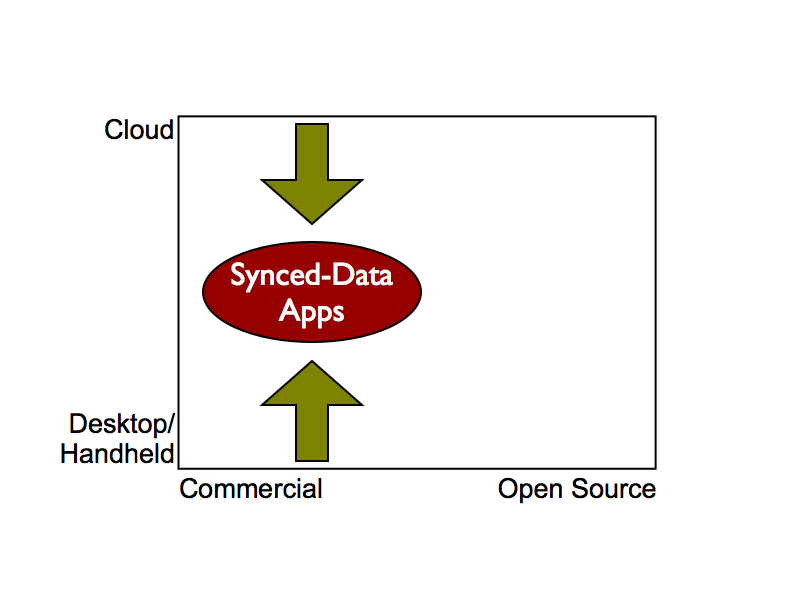 Synced-Data Applications. And with Google Gears, Google Docs has also entered the SDA software paradigm. With SDAs, it’s not just about the cloud, and it’s not just about the desktop/handheld. It’s all about the convergence that this software paradigm brings. A revised version of the figure I shared in the previous post on this thread is included below. Once again, it emphasizes that interest is focused on the convergence between the isolated realm of the desktop/handheld on the one hand, and the cloud (I previously referred to this as the network) on the other. Google Office for the Blackberry: Coming Soon? 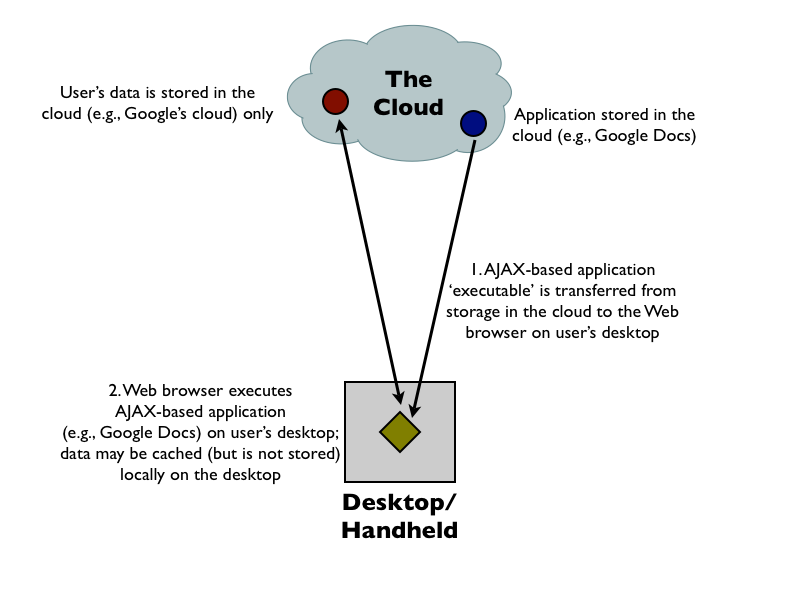 Now picture this: A J2ME client application for Google Docs & Spreadsheets. 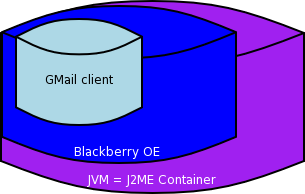 Alas, Google Docs & Spreadsheets (GD&S) isn’t based on some variant of J2*E.
In striking contrast, the GMail client for the Blackberry is a stand-alone Java application that executes within a J2ME container under the Blackberry operating environment. 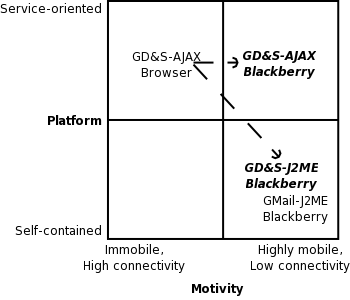 Clearly AJAX and J2ME are completely different environments/platforms. Thus it would seem that Google has the options summarized by a two-dimensional platform versus motivity grid. On the vertical axis, platform ranges from self-contained to service-oriented. Motivity is a bona fide word that is synonymous with locomotion (the power or ability to move). I intend here to coin a slightly different meaning, a juxtaposition of mobility and connectivity. More precisely, I propose to use motivity as a semi-quantitative measure of the degree of mobility relative to the degree of connectivity. As mobility increases, connectivity decreases, and motivity therefore increases. This is illustrated by the horizontal axis of the two-dimensional grid. It is also important to note that connectivity is itself a proxy for bandwidth and latency. More precisely, high connectivity is taken to imply high bandwidth, low latency connectivity. Thus a revised two-dimensional grid of the possibilities is shown below. 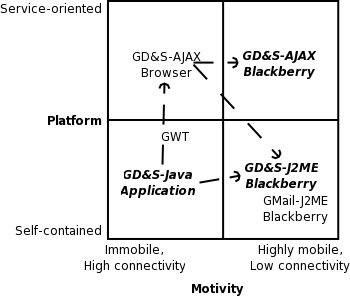 Either way, it may be some time before Google Docs & Spreadsheets makes it to the Blackberry.